It’s May already? Time is flying. Brown the ground beef in a large skillet. Drain the excess liquid. Place the browned beef into a 3 L or 4 quart baking dish to form bottom layer of pie. Add cream style corn and then the peas and carrots. Peel, boil, drain and mash potatoes while still warm. Add milk, butter, onion, salt and pepper. Beat until potatoes are light and fluffy. Turn into baking dish to form top layer. Bake in oven at 180º C (350 ºF) until potatoes are slightly browned (30 to 40 minutes). Serves 4 – 6. Note: For a slightly different flavour, add savory to the ground beef while it is cooking. Blend all ingredients in a food processor. Add olive oil a little at a time at the end. 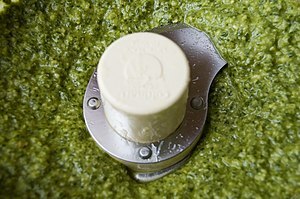 You want the pesto to be blended yet not smooth. It is best with a little texture. Serve at room temperature. Do not heat it. Serve over salmon or your favourite fish. Serve tossed with some basmati rice. Grease grill and preheat barbecue to medium. In a small bowl, stir oil with curry and garlic powders, ginger, salt and pepper. Using a brush or your fingers, spread spice mixture on both sides of chicken. Barbecue chicken with lid down until chicken feels springy when pressed, from 6 to 8 minutes per side. Serve with rice and raita. In a small pot, boil the ½ cup of water. Remove from heat and add raisins. Soak the raisins for about 5 to 6 minutes. Drain, and set aside. In a skillet, heat the olive oil and add the onion, curry powder, sea salt and pepper. Sautee until onion is translucent. Add the apples and stir well. Continue to sauté about five minutes. Stir in the rice. Heat through, add the raisins and toss. Makes 4 to 6 servings. This entry was posted in Food, Uncategorized and tagged Coriander, Curry, Pesto, rice, steak. Bookmark the permalink.